Your heating and air conditoning system is a complex mechanical system. Properly installing and maintaining them is not an easy thing to do. It requires education as well as skill. Too often, commercial building owners and managers feel rushed by “contractors” who prefer to keep the process as mysterious as possible, because it benefits them. ACCA wants to take the mystery out, and focus the benefit where it belongs … on you! Watch our free video, “A Guide for Business Heating & Air Conditioning Service,” for a full explanation of how to choose the right contractor, and what to expect from a professional contractor when they come to your building. The easiest way to make sure your tenants are comfortable — and your operating bills are low — is to take a little time to make sure that your heating and cooling equipment is in good working order by having a professional ACCA contractor provide regular maintenance on your system. Having a comprehensive planned maintenance program in place has many advantages beyond lessening occupant complaints. Planned maintenance is the number one way to get energy cost savings in any building. Besides reducing energy usage, regular maintenance prolongs the life of your heating and cooling equipment and can provide substantial savings through proactive repairs and replacement over reactive “breakdown” repairs. Commercial maintenance programs are not “one size fits all.” Your building is unique and requires a tailor-made program that fits your size, system, and, most importantly, your budget. A professional ACCA contractor can help you create a program that fits your maintenance needs. Even the most well-maintained equipment will need replacing someday. Replacement of aging or inefficient equipment can be pre-planned and budgeted based on life expectancy and operating cost. Pouring money into a unit that’s already 10 years past its life expectancy doesn’t make sense … even worse is waiting a week or more for a new unit to be installed during the hottest part of the summer. There is one piece of “jargon” that you should make sure you hear. If you are installing a replacement system in a low-rise commercial building, make sure you ask your contractor about Manual N®. 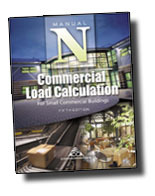 Manual N is the industry standard that describes a method for determining, basically, how “big” your air conditioning system should be for the size and type of building you operate. If your contractor says that a Manual N isn’t needed for your system replacement — even if that contractor is a member of ACCA — you should find another contractor. Full system replacements always require Manual N if they are going into a low-rise commercial building! When so-called contractors say, “Oh, your building is X square feet, so you need a X-ton unit,” you should tread very carefully! This “rule of thumb” is often wildly inaccurate. It results in the installation of systems that are often too big for your actual needs. When a system is too big, it costs you a lot of money. Your monthly utility costs will be much higher, and the system will work too hard resulting in premature failure. Worst of all, your occupants won’t feel comfortable and will blame you. Make Sure Contractors Ask the Right Questions! Most qualified HVAC contractors want to know about you and your business. Just as you want to know more about your contractor, your contractor should want to know more about you. They want to know your business goals and plans, and how the building has an impact on your business and your daily activities. Early questions about the building, usage, age, and importance to the business will help your contractor craft comprehensive solutions to help you operate and maintain your facility’s HVAC equipment and its environment. The qualified contractor will want to know about specific comfort or mechanical problem areas. This helps the contractor focus the survey efforts and cost analysis so he or she can provide you with correct options. The contractor may ask to meet with several people in different roles with the business to gain different perspectives. Access to the building and the ability to take equipment photos will help you “see” what the contractor “sees” and understand his or her recommendations. The contractor should also ask about the financial impact the HVAC systems have on the business. Cost categories may be discussed that include utilities, major repair costs, outsourced services costs, certain administrative costs, and even equipment replacement budgets. When the contractor notices budget issues, costs that are out of line, or energy escalations, effective solutions are sure to follow. Financial information also validates what is known about the equipment from the survey. To help you evaluate contractors who commit to quality against those who don’t, we’ve created a special checklistthat you can use to “score” the contractors competing for your business. More than just a scoresheet, this form actually explains in great detail all of the questions you should be asking your contractor, and all the steps they should be following when performing to the QI standard.